Yurts are Mongolian tribal dwellings, and are based on a 5000 year old design, built to withstand high winds and low temperatures in a beautifully desolate landscape. They are still popular today for communal living and easily transported by nomadic people. 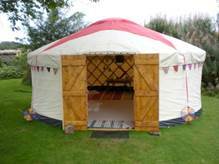 Traditional yurts or gers consisted of a circular wooden frame with a covering made of felt. The felt is made from the wool of the flocks of sheep that accompany the nomadic people. The timber that is used make the external structure is obtained by trading with the people who live in the valleys as it is not to be found on the steppes, the normal place of living and work. The frame is made up of lattice sections for the wall, a door-frame, roof poles and a crown. The frame is self supporting and depending on availability, the felt is additionally covered with canvas and/or sun-covers. The frame is held together with one or more ropes or webbing straps. 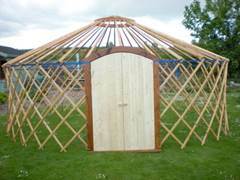 A yurt is designed to be dismantled and the parts can be easily transported on camels or yaks. The very first time that I saw a Yurt was at a mid-winter folk music festival held in the grounds of a Scottish Castle. It was a wild and stormy night but dotted among the trees there were several small, round canvas pods with wooden doors. Lit by candles and log burning stoves, the yurts glowed from within. Inside I found havens of warmth filled with rugs and floor cushions. There were musicians and poets performing to small audiences all relaxing around the floor. I was captivated by the wonderfully calm and energising environment that the round space provided. The following summer was particularly wet and the weather was never pleasant enough for summer barbecues or outdoor parties. My husband and I decided to commission a 15 ft garden Yurt by Paul Spencer of “Highland Yurts”. The Yurt fitted perfectly underneath a clump of ancient cherry trees. We put down a carpet and filled it with rugs and added a stove. We lit it with candles and hung wind chimes in the trees outside. It became a magical place to spend time with friends in the evening. It seemed far more sociable to sit and talk in a round space with a fire as people have done for centuries. The Yurt has even been used in the depths of winter with deep snow outside. In 2009 I was recognised as an emerging Scottish Quilter. I was invited to work on a special quilt for the Quilters’ Guild of the British Isles “Pearls of Wisdom Exhibition” to commemorate The Guild’s 30th anniversary, which was displayed at The Festival of Quilts 2009. Subsequently, the Loch Lomond Quilt Show offered me a gallery for their show in 2010. I daresay they meant me to send in some of the quilts that I had entered for shows in the UK and abroad but I decided that I would like to produce a whole new collection of quilts. I had already drawn a few sketches in my notebook for this new collection when I had the incredible idea of how I would like to make enough quilted panels to display around the external wall trellis of a small 10 ft. Yurt. The idea of a making a quilted Yurt had first occurred to me while considering how to insulate the canvas of the one that I have in my garden in the “den” where my crafty friends and I meet to drink gin by firelight and come up with various crazy concepts involving fabric or felt. I decided that quilted panels would add warmth and look interesting but I did not want to cover up the structure of the wooden lattice walls. Aberdeenshire Council awarded me a modest Craftmaker Award so that I could purchase a yurt frame for exhibitions. I arranged a meeting to discuss the design with “Yurt Man”, Paul Spencer. On arrival at his yard, I noticed that he had an 18ft yurt frame under construction. I walked in through the wooden door frame, looked around the magnificent space and decided that this larger one would become my new project. I made a few notes and sketches, jotting down some measurements. It has always been difficult to imagine the completed project just by looking at the information on paper. Once I took the yurt frame home, it was all dismantled and neatly stacked at the back of my workshop so it didn’t look particularly big. I decided to make a series of patchwork panels 30” wide and 54” long so that I would never be working on anything too cumbersome. The end of the project was always pushed firmly to the back of my mind. I only had a vague idea of how it would all be joined together and whether there would even be a roof. Later on would come the complicated calculations involving Pi. An 18 foot diameter Yurt is 678” all the way around; the roof crown is 132” around – there are 13 roof panels and approximately 20 wall panels with tweed junctions in between. Since these are all attached to each other with Velcro, they can all be swapped around and the panels can continue to be stitched or embellished. There is a painted double wooden front door. The interior is a colourful space that gives the viewer the opportunity to look at quilting designs from the reverse side. The Yurt can be filled with rugs, lights and furnishings if desired so that visitors can sit down and relax and absorb the soothing atmosphere. The roofing decision was made after a trip to a woollen mill to buy some upholstery fabric with my two best friends. 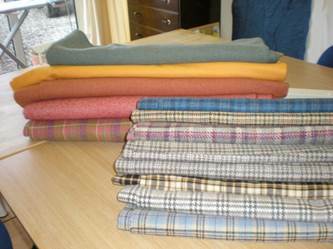 There were several lengths of end of roll tweeds available to purchase. Some were 3 or 4 yards in length and some were shorter. I thought that the Yurt would look great with a pieced roof of traditional Scottish tweed. The tweed looked fantastic all stacked up on the shelf of my workshop. It was a while before it dawned on me that working with the tweed fabric would be very different to using heavy duty tent canvas as it is more loosely woven and stretchy so it would not fit the roof as neatly. The tweed would obviously have to be quilted in order to give it more substance. I sketched out very rough ideas that would include circles and Celtic inspired designs. The piecing would be loosely based on Amish or Gees Bend style quilts and whatever else seemed to work. There was no plan at the beginning; it all evolved gradually, after many discussions and sketches with a friend who is an upholsterer, on how it would all fit together. I also bought a bolt of plain cotton for dyeing, 50 packets of dye from Hungary, several large cones of thread and some huge rolls of industrial velcro. During that autumn I attended a couple of advanced piecing technique classes that I could adapt for the Yurt. The tutors always seemed alarmed when I insisted on making my class sample several times larger than everyone else’s and were sceptical that I would actually finish my projects. They were also concerned about my choice of fabrics, especially the shiny stuff. I was notorious for using gold lamé in my quilts. It used to be a joke; I would include a piece just for fun. It slips and puckers and melts if the iron is too hot but the texture after quilting is wonderful. The other fabrics used were mostly richly coloured shot-cottons, woven in India which were challenging to work with as they often frayed or stretched. The end of 2009 became very busy after I was appointed the new sales representative for APQS in the UK. There were customer quilts to be completed by Christmas, a certain amount of amateur pig-husbandry to attend to and the usual flurry of family activities in the festive season. I decided that I would concentrate on the Yurt project after the Christmas holidays were over. Meanwhile, I decided that I had to renovate my workshop, painting the concrete-block walls in sub-zero temperatures. By the end of January 2010 it became apparent that piecing and quilting 20 or so intricate panels by the beginning of May was a little ambitious so I turned to my virtual friends on the APQS forum and appealed for “Stunt Quilters”. I was overwhelmed by the enthusiastic response and eventually had to ask people to stop offering their help. I had a range of volunteer Stunt Quilters from beginners to highly skilled quilters all over the USA, Canada and England. I sent sizes and fabric specifications, ideas of the sort of panels that I would like to make myself if I had more time and posted several packages of material all over the globe from my rural post office. I corresponded with the Stunt Quilters by email, phone, Skype and letter. They were amazingly supportive and I encouraged them to use their own designs and ideas. The colours that I used all had a bearing on my Scottish landscape. I took photographs of trees, hillsides, bracken and dry stone walls. The linear quilting on the tweed roof is representative of the corrugated iron roofs on tumble-down farm buildings and follows the long lines of the Yurt roof poles. It also looks like the heavily padded winter gear worn by Yurt dwellers in Mongolia. There are traditional Celtic and Mongolian influences in the stitching patterns used throughout this project. Circular spirals and square mazes appear on textiles and stone carvings in both cultures. The areas of stitched gold look like ancient metal-work. Circle motifs and Celtic designs are repeated throughout. My style of quilting is intensely stitching which is often embellished with fabric paints and crystals. Creating texture and interest is very important to me. 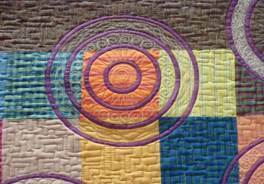 My quilting has been described as “organic” and “accessible” by other well known quilters. I just like to break the rules and do what I like using whatever thread I happen to have. From the beginning of 2010 I worked day and night to get the project completed. The Yurt project became a journey of self discovery and I felt as though I was driven to fulfil a huge imaginative potential. I was privileged to have been able to work collaboratively with so many creative people, meeting major challenges in order to produce such an exciting project. The Quilted Yurt attracted much attention on the Internet and soon the president of the American Quilt Society got in touch inviting me to exhibit at one of its large show in the USA. The Quilt Museum in Paducah enquired about the Yurt as a potential exhibit. I never imagined that the Yurt would generate so much interest beyond LLQS, where it was exhibited for the first time in May 2010. It has since been taken to Quilt Guilds around the UK on the roof of my Land Rover. It has been admired in Inverness, Fochabers, Perth, Newcastle, Durham and London. It has even been used for outdoor educational events in a Scottish forest in dry weather. After investigating the impracticalities of shipping the original Yurt frame to the USA, I finally realised that I needed to find a yurt frame maker over there. Everything seemed to be ticking along according to plan - I was busy making extra panels and quilting a second roof when the Vermont frame maker pulled out at the eleventh hour. 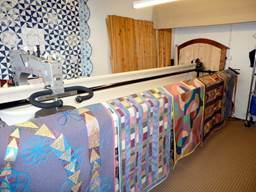 One of the Stunt Quilters, Terri Kirchner, who was President of the Fiber Arts Museum in Cedarburg Wisconsin, planned to use local carpenters but they later decided that it was too tricky an undertaking. Finally, Yurts of America came to the rescue and built a bespoke frame for the American Quilted Yurt. When one of Terri’s friends dropped her daughter off at college in Indiana, she drove back home with a flatpack yurt frame in her trailer. The new frame was a different design to the original Scottish one so an entirely new roof had to be designed, cut and sewn in Scotland using rough sketches before being shipped to the USA along with 25 yurt panels in two bulging suitcases. The Quilted Yurt USA was exhibited in America for the first time at AQS Des Moines then it was taken to its new home in the magnificent WMQFA Barn. The Stunt Quilters were thrilled to be able to see the magnificent finished project for themselves. The curators at WMQFA arranged for the USA Yurt to be exhibited in a special exhibition at IQA Houston 2012. I attended the Houston show and it was an amazing privilege to explain the history and process of the Quilted Yurt projects to visitors and dignitaries at one of the biggest, most famous quilt shows in the world. It was also exhibited at IQA Chicago in 2013 and new seasonal themed panels have since been made by members of WMQFA. 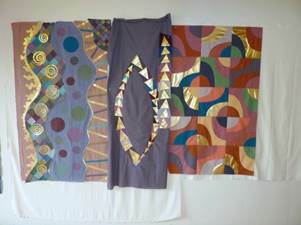 Elements and Inspirations from the Quilted Yurt Projects subsequently led me on to create a series of Norse metallic whole cloth quilts, the Quilted Coracle, and a Quilted Celtic Seasonal 12-Totem Henge.